This month, the RAM opened All the Buzz, an exhibition devoted entirely to the winged and many-legged creatures that crawl the earth. 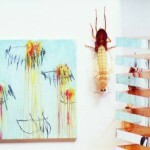 The gallery walls are decorated with whole and deconstructed insects, as well as dozens of artistic renderings. Three artists have offered their own visual interpretations of the medium, and each presents insects in a different context to expose viewers to the parts of nature that are intentionally unseen. Insects, with their prehistoric body structures and skittish behavior, don’t really appeal to humans. We don’t want them as pets, in our homes or anywhere near us, really. On some level, we’re all just powerfully afraid. It’s usually fear that keeps people from truly exploring nature. RAM’s Curator of Exhibitions Lena Vigna explained that each artist used the medium in a way that is aesthetically appealing or that draws on incidents from real life to lessen those fears and at the same time challenges people to contemplate their relationship with the natural world. Immediately upon entering the gallery I was drawn to Jennifer Angus’ rich and ornate installations. 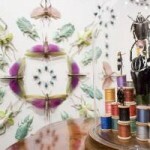 Over 1,000 insects decorate the walls in various repeating floral patterns. Among the wall collages are pages from a 19th century illustrated children’s book that have been framed in gilded glass domes. The piece spans down a corridor, resembling what you might imagine a classic Victorian parlor would look like. beeswax dioramas place insects in human roles, posing them in specific settings that recalled turn-of-the-century morality tales. Small beetles clamor over their desks in the schoolhouse while a somber bunch hold an observance in the nearby graveyard. Everything is hand-made and cast out of beeswax. And all of the insects were procured responsibly— meaning they had already died before being used for art. And Angus, who recently had a similar exhibit at the Haggerty Museum, reuses all of the materials from her installations. Milwaukee-based artist JoAnna Poehlmann’s lithograph prints recall early scientific surveys or illustrated field manuals. RAM has housed several of Poehlmann’s earlier mixed media pieces and have added new works on paper and several small books. 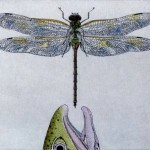 Her meticulous prints are reminiscent of aged naturalist books. It recalls a sort of childish curiosity, peering through the glass at her richly detailed illustrations —you want to dissect the image, see each part up close. It’s not a gross bug, it’s an amazing organic machine. I know, it sounded weird to me too. 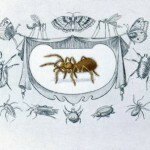 Catherine Chalmers has spent most of her art career nurturing and fostering cockroaches to create art, and also to make a statement about humankind’s perceptions of the natural world. In the three-part series, Chalmers poses the insects in various familiar, and sometimes disturbing, situations. In Imposters, Chalmers subverts the way we perceive roaches by disguising them with say, a tuft of pink Marabou feathers or a few strokes of paint, and then places them on the delicate petals of an orchid. 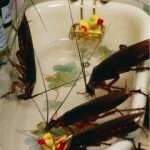 In Residents, Chalmers tests comfort levels by putting roaches in various domestic settings like a nursery and the quintessential 1950’s American kitchen. On a far wall, short films depicting primitive execution methods play in a continuous loop. Large photos of cockroaches swinging from the gallows or strapped to the electric chair line the walls. The Executions sequence is lightened up by the “trophy wall” on which five roach heads have been humorously mounted on paper. As our culture evolved, humans moved farther away from nature — both geographically and philosophically. We fortified ourselves in homes and tend to introduce only the parts of nature that we could control, like domesticated animals or house plants. But by assigning human characteristics to insects, the work featured in All the Buzz wants viewers to question what they view as “acceptable” nature, and where do we fit in with the rest of it? 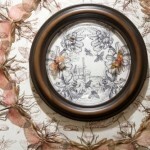 All the Buzz is on view at the Racine Art Museum, 441 Main St., Racine, until September 2010. Each of the artists featured will also conduct behind-the-scenes gallery tours during one of RAM’s free First Friday events. For more information, visit their website. Photos courtesy of the Newark Museum, Catherine Chalmers and photographer Dedra Wahls. I haven’t seen this show yet, though I hope to, but I’ve seen Angus’s work in several other places and it’s wonderful every time. When seen singly, or massed, in another context, the insects might be repellent, but that reaction doesn’t even begin to develop when confronted by the orderliness and sheer beauty of her designs. Thanks for the thoughtful analysis.